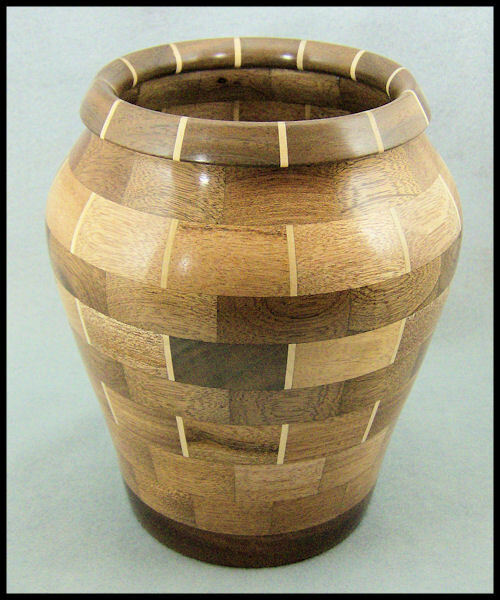 Craftsman / Arts & Crafts inspired wood bowls, vases, urns. Custom designs available by request. Made up of 417 individual pieces of wood. Made up of over 500 individual pieces of wood. Features : "Stained Glass Window Motif " in a pair of Accent rings. Personalized engraving and surface treatments are available. 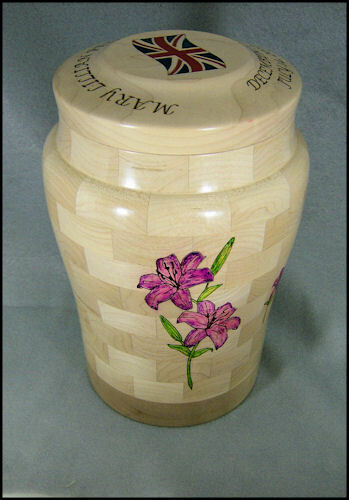 The Urn below shows some examples of the various types of treatments which are possible. 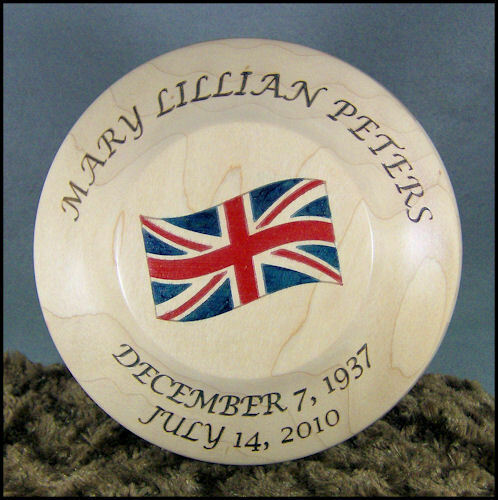 This includes plain and fancy text engraving, laser etched artwork which is hand tinted and relief carving. 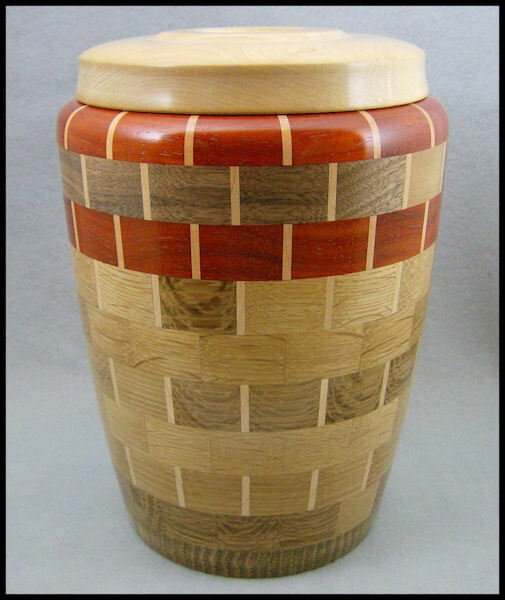 The inspiration for the creation of these turnings comes from my relationship with my father. 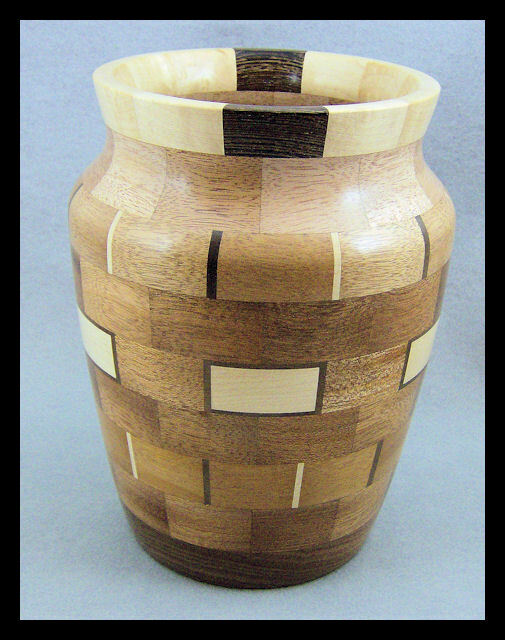 When I started turning wood many years ago he was a source of constant encouragement. Now that he has passed on I still draw upon his comments and the spirit in which they were always given. For me there is nothing else quite like the process of creating art on the lathe. When I am working on these pieces it as if he is standing over my shoulder. The sculptural forms of bowls and vessels have always been of special interest to me. my end product. While I enjoyed the process I always felt like I was being held back. 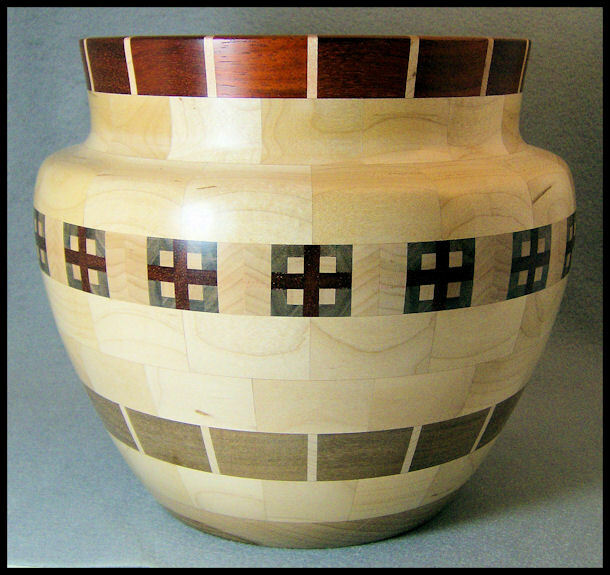 My progression into these segmented woodturnings has opened up an almost unlimited range of design possibilities. With careful planning and execution it is possible to get results which far exceed the limitations of a single piece of wood. 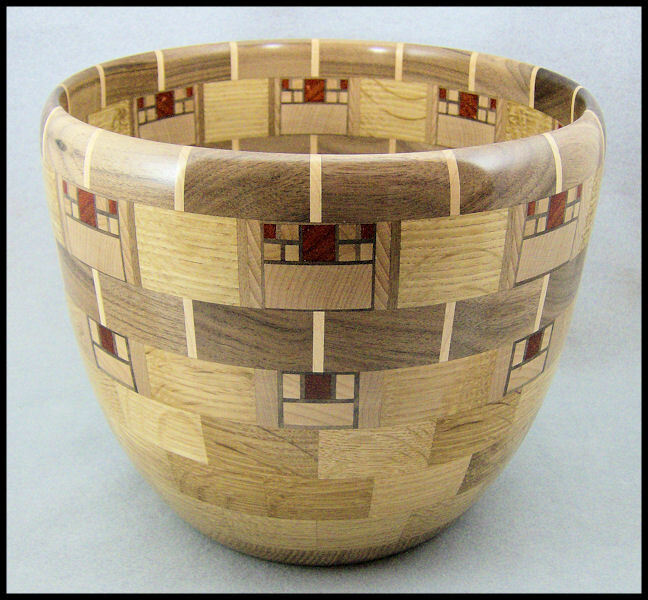 These vessels are created by a process of designing and constructing a turning blank in layers. Each layer is made up of a number of precisely cut segments. 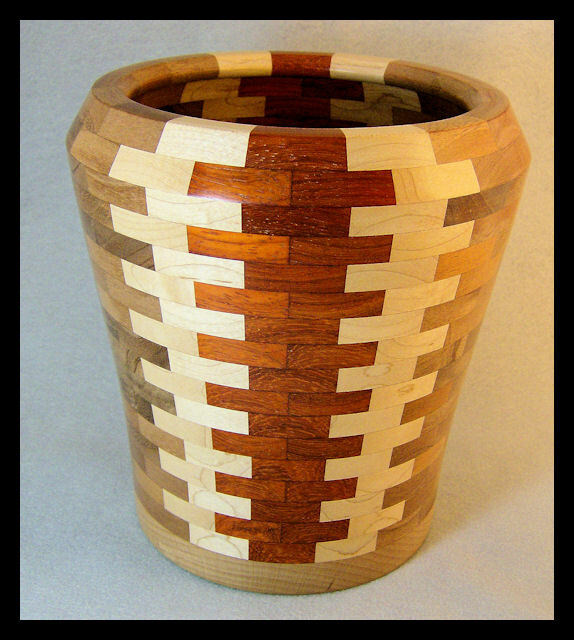 Depending on the design the segments themselves may be a single piece of wood or they may be made up of several pieces. 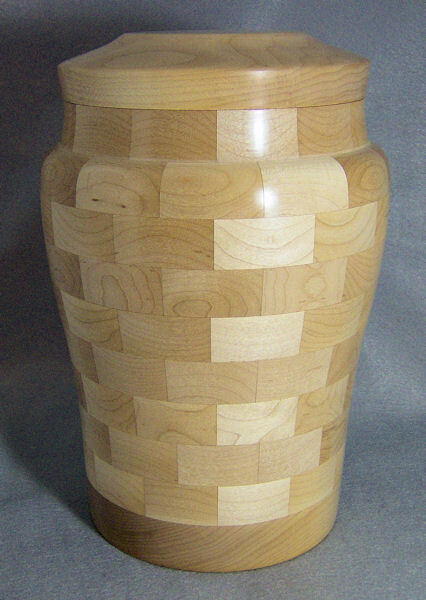 Once assembled the resulting turning blank contains all of the elements which will make it visually unique. It is at this point the sculptural shaping begins. A variety of techniques and tools are employed to "unlock" the final shape of the vessel. Each of these vessels is then hand sanded. They are sealed and finished inside and out. The final finish is then waxed and hand buffed to bring out the luster in the various woods used. Because of the natural variations in species and grain and the fact that these are hand shaped, no two pieces are identical. 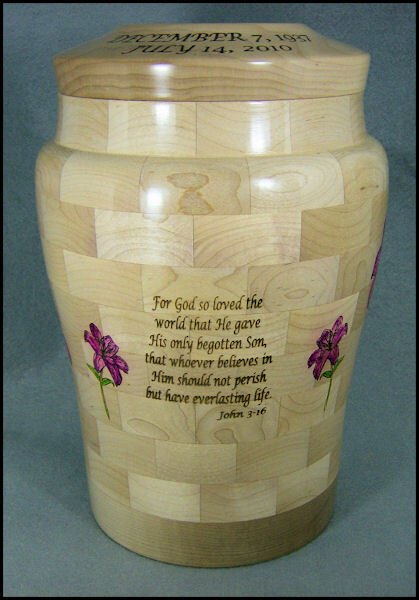 Each of the urns I make are carefully crafted keepsakes meant to evoke memories of our loved ones that have passed on. 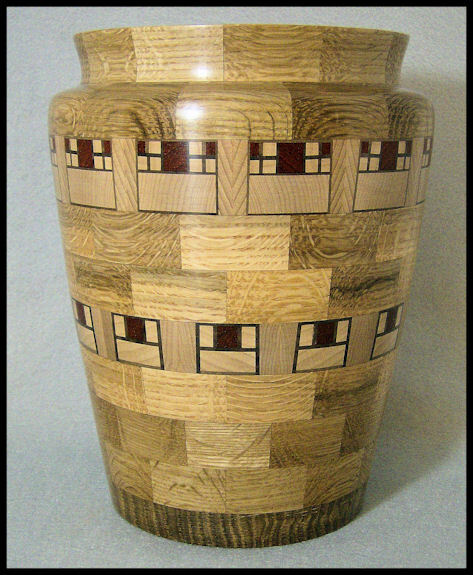 Every urn is unique ..... just as every soul on earth is. I hope you enjoy these vessels as much as I enjoy making them. Please Bookmark this page as I will be adding many interesting new pieces in the upcoming months. $ 575 as shown. Can be laser engraved. Approx. 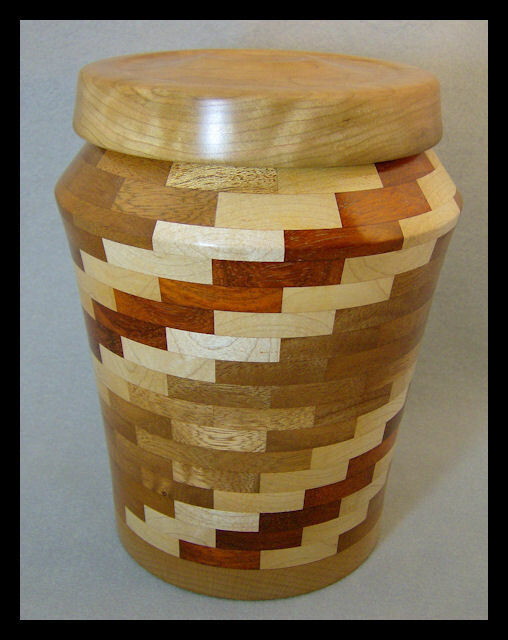 9" high x 7 1/2" in Diameter. Screw on lid. 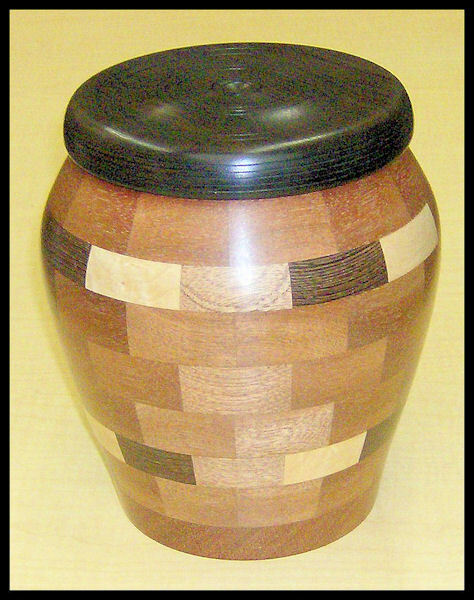 Quarter sawn Sipo mahogany, Maple, Wenge and Ebony.